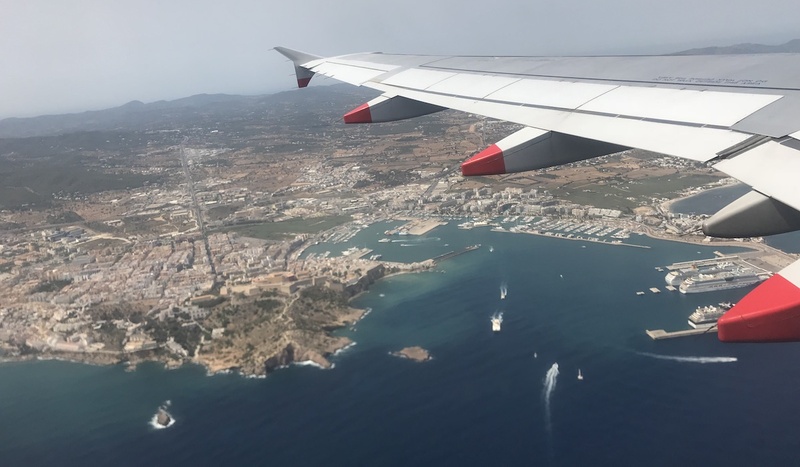 On an island where partiers will fly in and out for a short stint of partying, we ended up spending an unusually long NINE DAYS in Ibiza. This is our second time in Ibiza (twice in a year!) — and along the way, we’ve picked up several tips and tricks on how to party (and survive!) in Ibiza on a budget. We came for Carl Cox, and stayed for Eric Prydz. In total, we spent 8 nights / 9 days in Ibiza. Without a doubt, this was the most expensive part of our world travels thus far. Here’s everything I know about partying (and surviving) in Ibiza on a budget. We’ve been to Ibiza twice: the first during closing week at the end of September, and the second, in the midst of peak season in mid-July. The exact same hotel costs 3x as much to stay in during peak season compared to closing week. As accommodations have been our biggest expense while in Ibiza, go during shoulder season (June and September) if you want the biggest savings on accomodations which will help you party in Ibiza on a budget. When travelling, four seems to be the magic number for group size. You can easily spilt a hotel room between four people, an entire bottle of wine or alcohol, car rentals, and maximize the number of people in a taxi. The first time we went to Ibiza, we met up with two of my friends from back home — sharing drinks and taxis helped all of us save a bit of money. If you’re not going to take a bus at any other time in Ibiza, at least take it to and from the airport. The bus to/from the airport is so easy to take to Playa D’En Bossa, San Antonio and Ibiza Town. We paid €3,50/person to Playa D’en Bossa, compared to an average cost of €15 – €20 in a metered taxi. When we looked on booking.com and filtered by price, San Antonio consistently offered the lowest prices for hotels in Ibiza. San Antonio isn’t bad — it’s known for its beautiful sunsets, and is within walking distance to the famous Cafe MAMBO and Cafe Del Mar. However, it’s further away from all the major clubs, so once you factor in the price of transportation, it’s probably best to stay elsewhere — like Playa D’En Bossa! We love staying in Playa D’en Bossa. It’s central location is great: it’s fairly close to the airport, within walking distance to several clubs (Hi, Ushuaia, Sankeys), near the beach, near the boat terminal for departures to Formentera and various boat parties, and really has everything you need in one place. 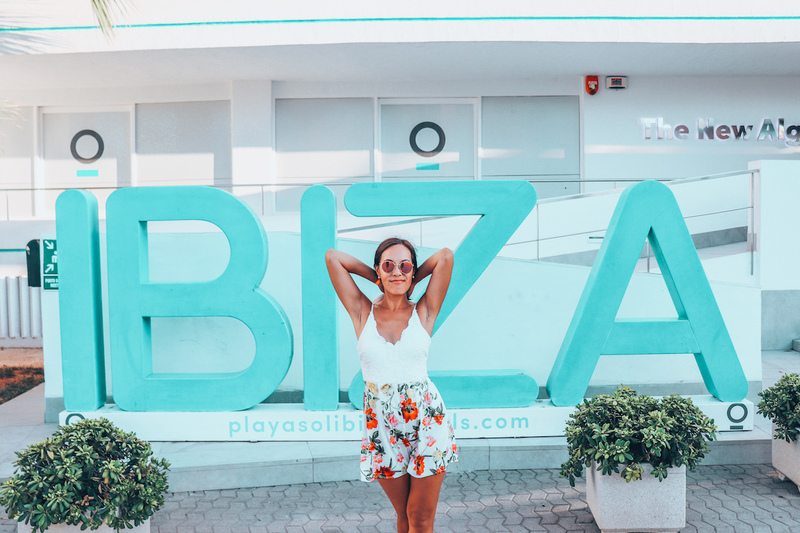 Even though San Antonio may have cheaper hotel options, you could save more staying in Playa D’En Bossa by being closer to everywhere you need to be. Even if you don’t cook full meals, having a kitchen with basic utensils will save you a considerable amount. It’s healthier than eating out and way cheaper. Buy fruit, yogurt, and granola from the grocery store for breakfast. We’re also a fan of DIY charcuterie: a loaf of fresh bread, nuts, cheese, salami, hummus, and cucumber are some of our favourite things to buy at at the grocery store. This won’t work for everyone, but it worked out amazingly well for us, and allowed us to affordably (somewhat) stay in Ibiza for an extra 5 nights. During peak season, we originally booked three nights at an apartment-hotel in Playa D’En Bossa. Towards the end of our stay, we wanted to stay for another five(!) nights. Weirdly, even in peak season, we noticed that not all the accomodations are fully booked. Hotels in Ibiza are overpriced, but not necessarily overbooked. They are just trying to maximize value from travellers booking online in advance. We talked to the front desk of the place we were staying, who encouraged us to email the manager of the hotel, I asked for their “best rate” — and we ended up scoring the place for an amazing €95/night. This is a booking in the ideal Playa D’en Bossa during Ibiza’s peak season, for a private room and bathroom, kitchenette, pool, 24 hour reception, in an excellent location! We checked online a few times after we booked, and the hotel continues to be listed at €250/night on booking.com. Unless you’re staying in San Antonio, there is absolutely NOTHING less than €100 available in Ibiza. We saved €750 by simply asking for the hotel’s best rate in person. 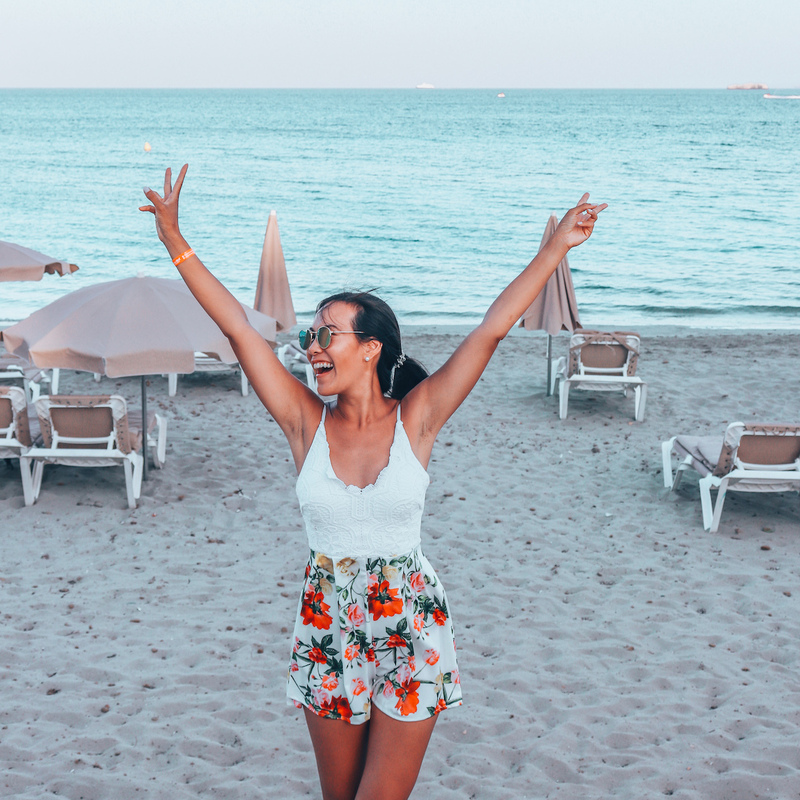 This worked for us because we had already built up some rapport at the place we were staying at and we also had a lot of flexibility — the deal wasn’t confirmed until the morning we were due to check out. Granted, we probably wouldn’t have stayed in Ibiza for so long if we couldn’t get this deal. Watching the famous Ibiza sunset from San Antonio’s “Sunset Strip” is a must-do in Ibiza. 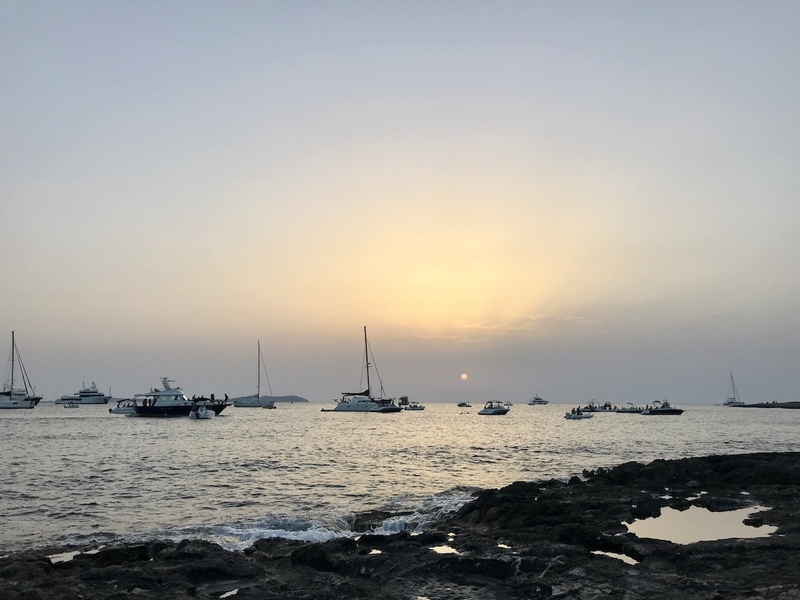 Most people will flock to the famous Cafe Del Mar and Mambo, only to be disappointed about the exorbitant food and drink prices, and mandatory minimum spend to sit at a table. However, there’s a strip of rocky beach outside both these restaurants that’s free to sit at, and you get a front row, waterfront view of the sunset. Get takeout, buy a few beers from the grocery store, and watch the sunset on your own terms — it’s equally beautiful. 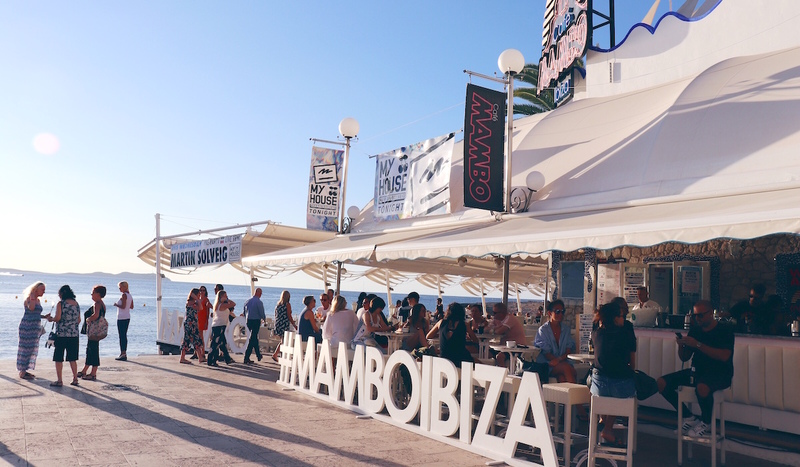 Is the Minimum Spend at MAMBO Worth the Sunset View? There are usually two prices for club tickets. The early admission may be valid for entry before one, while regular admission is anytime after 1am. The price difference seems to be about €10. If you’re staying for 3 days or more, it may be worth it to sign up for a boat party. The boat parties in itself are relatively good value — they are priced at around €80-€90 for a 4-hour ride and includes food (paella, fruit, etc), water sports (ride on a banana boat, jet skiing), all you can drink on the boat, and after party admission to Bora Bora! But for us, the main selling point was that the boat party tickets included admission to 2-3 major clubs of our choosing. If you know exactly which DJs you want to see, see if guestlist to those shows are doable with the boat party. 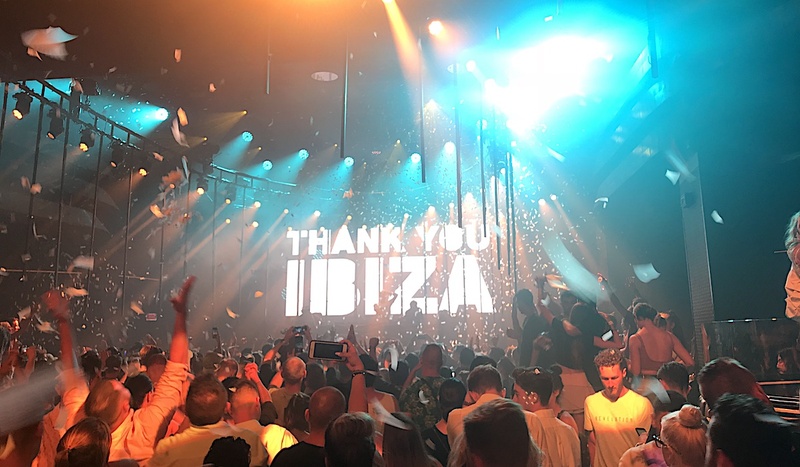 We went to Eric Prydz at Hi Ibiza for free — tickets are usually €40. If you’re not picky about seeing specific shows and just want free admission to clubs in Ibiza, even better! What you’ve heard is true — the drink prices at clubs in Ibiza are incredibly expensive. 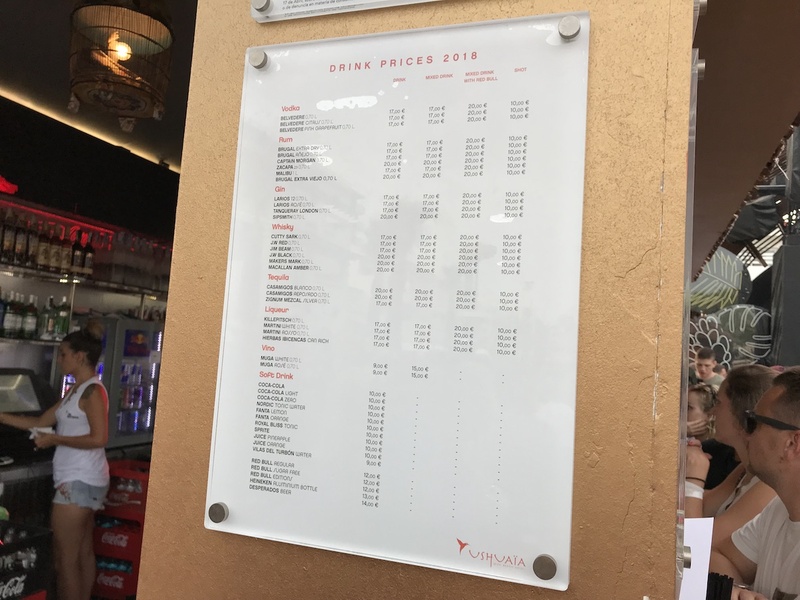 Here’s a list of posted drink prices at Hi Ibiza. With prices like these, best to pre-drink and avoid buying anything from the club. Whereas in other cities I might brush off club promoters handing out discount flyers, in Ibiza, I took every one! When you’re standing in line for other shows, promoters from other clubs will often hand out discount wristbands for other event. Likewise with being at the beach in the late afternoon — try hanging out on the beachfront by Ushuia Towers. We used our Sankeys wristband and showed up a minute before 1:30am — we were the last people they gave the early admission rate to! Everyone after us had to pay €25. Tap water is not safe to drink in Ibiza, so you will have to rely on bottled water. Buying the biggest size of water (6.25L is what we found) and filling up a personal sized water bottle is more cost effective — and environmentally friendly — than buying one bottle of water at a time. Accomodations, clubs, and drinks cost a lot in Ibiza — but it’s free to go to the beach! It costs nothing to enjoy the amazing weather in Ibiza, head to any of the local beaches and rest up for a long night ahead! This is amazing! Definitely a place I’d love to visit someday. Thanks for the great tips!